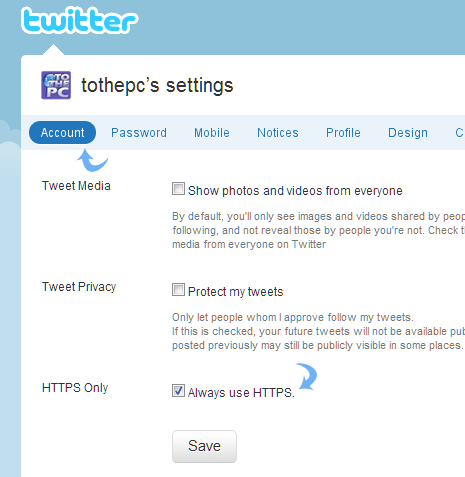 Now you can access Twitter website in more secure environment by enabling https setting. This enhances security and protects against possible hacking even when Twitter website is accessed on unsecured wifi internet connection. You can turn on https setting for your Twitter account from Settings webpage for more secure Twitter usage all the time. 1. Goto Twitter.com and login into your Twitter account. 2. After login, click profile name at top right and then click Settings option in the drop menu. 3. On the Settings webpage (under Account tab), scroll down and click to check (tick) Always use HTTPS option. 4. Then click Save button. You will get prompt to enter Twitter account password to save settings change. After entering correct account password, your Twitter account with have https setting enabled for more secure browsing of Twitter website. You will notice Twitter URL as https://twitter.com instead of http://twitter.com URL. Similarly, you can use https setting on Facebook to enhance security while using Facebook account. Twitter from flock web browser, integrated client!